alaTest has collected and analyzed 6 reviews of LG 55EA970V. The average rating for this product is 4.6/5, compared to an average rating of 4.6/5 for other products in the same category for all reviews. We analyzed user and expert ratings, product age and more factors. Compared to other products in the same category the LG 55EA970V is awarded an overall alaScore™ of 91/100 = Excellent quality. The LG 55EA9700 is a feature rich fabulous TV delivering truer black levels and great picture quality. 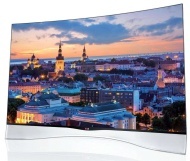 Before buying, do take a look at Samsung’s UHD Curved TV which is a notch up in terms of features, picture quality and 3D rendition.